On this page the basic causes of ovarian cysts are discussed. To understand the information better we advise that you first review the following pages "Female Organs" and "The Normal Ovary". 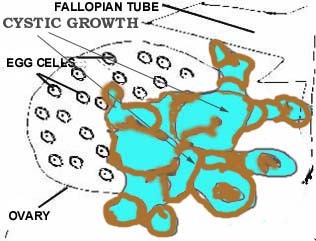 The follicle does not rupture and the egg cell is not released. In this case the follicle grows bigger and bigger and become a cyst. This kind of follicle can become very large. The corpus luteum can grow abnormally large and bleeding can occur in the cavity inside corpus luteum and cause it to become a large cyst. 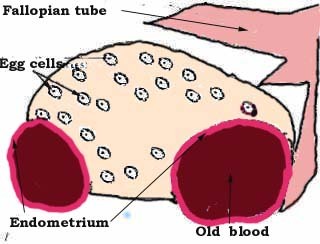 The cells surrounding the egg cell might began developing spontaneously and cause abnormal cyst formation. Some of these cyst can become cancer. Endometriosis can occur on the ovaries. It can infiltrate the ovarian tissue and can cause cysts. (For more information see Endometriosis). Not all cysts will cause menstrual abnormalities. They will only effect the menstrual cycle if they secrete hormones. Likewise ovulation is not necessarily effected by cysts. Cysts are painful and potentially harmful conditions. They are an important cause of pain in the lower abdomen ( pain in area below the belly button). Medical advise should always be obtained in cases of abdominal pain. This illustrates a large simple cyst. It is a follicle that continued to enlarged and failed to rupture. (Compare with normal ovulation). It is also called a follicle cyst. This illustrates a corpus luteum cyst. Corpus luteum cyst can become very large ( more than 5 cm in diameter). Bleeding can occur in the center of the corpus luteum and causes it to enlarged and to become a cyst. 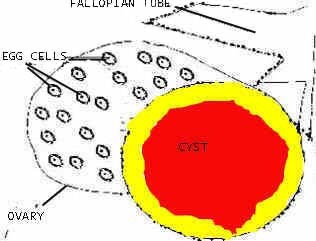 This illustrate a papillary cyst. The lining is thick in certain areas causing solid tissue to project into the lumen. Cyst with solid areas should always be further investigated ,because some of them might become cancerous. 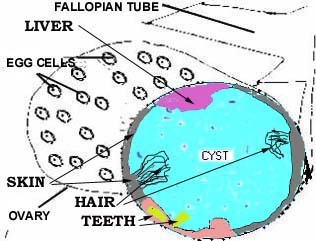 The names of other similar cyst and a classification of the different cysts is beyond the scope of this site, but all cyst with solid areas on ultrasonic examinations ( like the opposite one) need further investigations. This cyst contains abnormal tissue. It is usually lines with skin containing hair and hair follicles, teeth, liver , bone etc. They probably originate from egg cells which start developing on their own , only to produce abnormal chaotic tissue. Ovarian cysts can become cancerous. Any cyst with solid areas, persist longer than 4 menstrual cycles or keep on enlarging should be further investigated. This drawing illustrates cystic ovarian cancer. 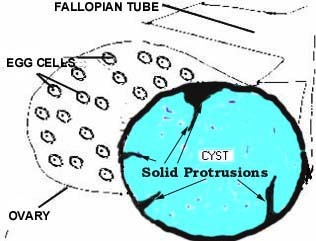 Multiple cysts joint by solid tissue invades the ovary and surrounding tissues. This type of cyst does not originate in the ovary, but develops from endometriosis. Endometrium tissue implant on the ovary causing endometriosis. The endometrial invades the ovarium forming these chocolate cysts filled with old blood. An ovary contains more than 250,000 egg cells , all of them potential cysts. Most women will developed a cyst at least once in there life time.